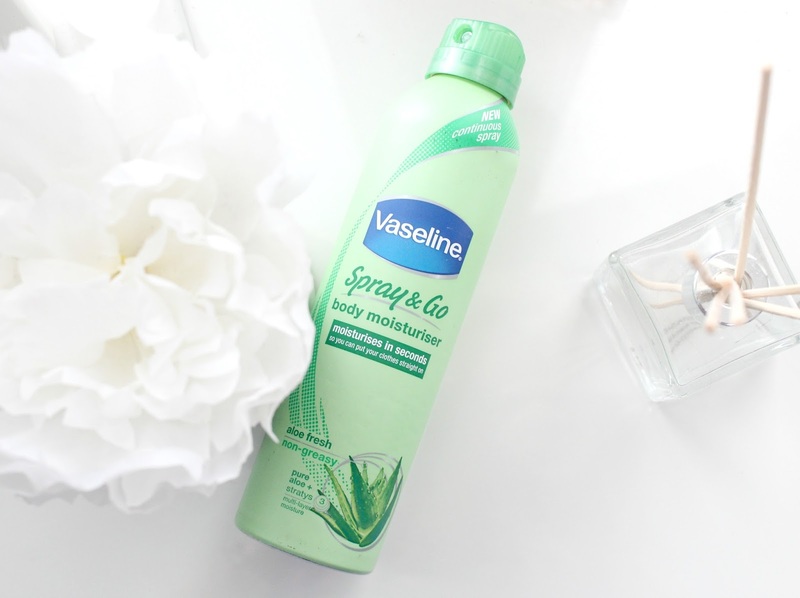 When I first saw the Vaseline Spray & Go Moisturiser popping up on blogs, I immediately knew I wanted to get my mitts on it. Moisturising my body is one beauty regime I do not enjoy partaking in so anything that claims to make what I regard as a chore easier is a must-have for me. Some may see moisturising with a luxurious body butter soothing and relaxing but for me its just a big fat pain in the bum. I lead a pretty hectic lifestyle so I just don't have time to apply creams and wait around for them to sink in before getting dressed. Don't get me wrong - I do love body butters and have quite the collection (Soap & Glory 'The Righteous Butter' is a personal fave) but they don't get used anywhere near as much as they should because of this very reason. With this being said, you can imagine my joy when I discovered the clever folk at Vaseline had come up with a genius product that would make moisturising my body oh so easy. I decided to buy it while I was having an online Boots splurge and I'm so glad I did as I am IN LOVE with this product. There's three variations/scents available - Aloe Fresh, Cocoa Radiant and Essential Moisture. I decided to go for Aloe Fresh as I hate Cocoa scented products and I liked the Green Aloe Fresh bottle the most out of all three. When I first ordered it, I wasn't expecting to be blown away - I mean how good can moisturiser in a can be? I'd also read a lot of mixed reviews - some poeple love it and others don't get the hype. Upon first application, I was immediately impressed with the concept - a very fine and even mist of product that transfers to the skin as a milky lotion. I also immediately noticed the scent and its absolutely beautiful - very fresh as the name suggests. Even my boyfriend commented on how nice is smells which is a big compliment coming from a male who wouldn't normally pay any attention to that kind of thing. I also love how quickly the product sinks into the skin. As soon as I've covered myself with it, it starts sinking in immediately and when rubbed in it vanishes within seconds. As the name of the product states, it really is a 'spray and go' product - spray it on and minutes later you're good to go. There's no need to stand around naked waiting for it to sink in (we've all been there ladies) and it doesn't leave a sticky or greasy film on the skin either. I have to admit it isn't as effective at moisturising my skin as a body butter would be but thats inevitable due to the difference in textures. However, it does still provide my skin with light hydration and I much prefer using this product on an everyday basis than a heavy body butter. 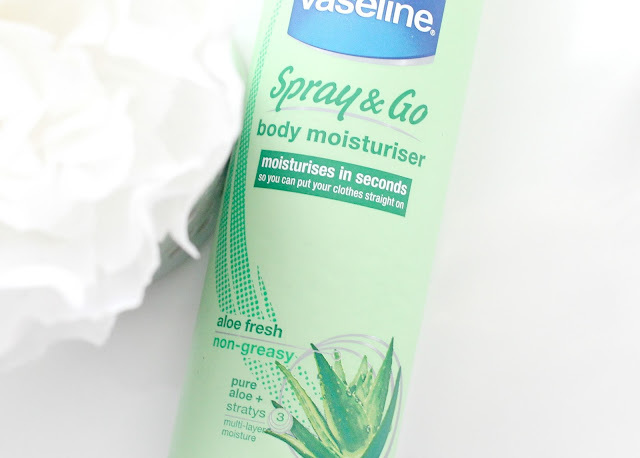 I'll still use a body butter when I feel my skin is very dehydrated but for day to day use, the Vaseline Spray & Go is perfect for topping up my skins moisture levels. So, would I repurchase this product? 100% YES. It may not be the most hydrating moisturiser I've used but for days when I'm in a rush (which is most days) its the perfect product for spritzing on. Its completely effortless and smells divine. If like me you don't have the time for laborious moisturising regimes, you'll love this product. Have you tried the Vaseline Spray & Go? Its available to buy here for only £4.99 - what a bargain! 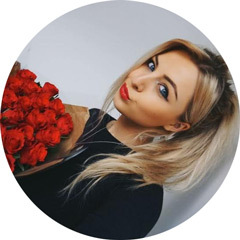 I reviewed this product a month or so a go on my blog and I really like it! Really is fab for those of us who don't have the time or energy to thoroughly moisturise! I would love to try this but it's not avaliable in Spain. It sounds great!! This sounds fabulous, I must admit I've seen it about a million times whilst in boots but didnt want to give in to wha i thought would be a fad but im lazy and never moisturise at all and i think this would be perfect for me. It sounds so quick and easy to use so yes i shall be jumping on the band wagon! I have been so interested in this product. I hate applying moisturizer, because it takes FOREVER to dry! So buying this next time I go to CVS! Ohh what a clever product! I'm so lax with body moisturising so I could really do with something like this- definitely going to give it a go! 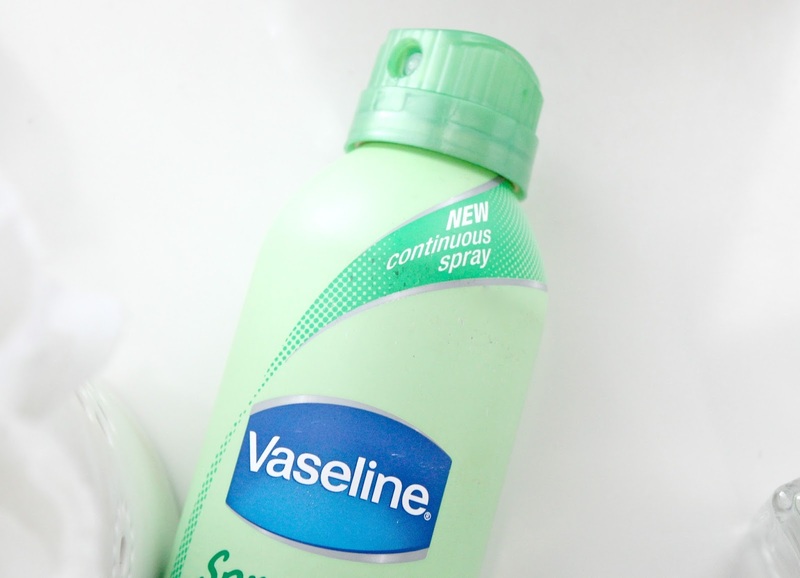 Ive had this on my wishlist for ages but took it off after loads of people telling me to be careful with vaseline due to it containing petroleum, I don't know much about why it's a bad ingredient or if it even is so i'm gonna research it because this product looks too good to resist and your review has made me want it more! Great post! This post really makes me want to go out and get it! It seems perfect for (lazy) me! I really really want to try this product! Everyone keeps raving about it and im just hoping that they have it in my country. Keeping my fingers cross!! This product is making me feel very guilty/ disgusting for showering at night and not caring that my body moisturiser hasn't sunk in! You might have sold it to me though! Decision made, I'm heading out to cheer myself up today with a little retail therapy, and this little product is coming home with me! This looks amazing! Definitely going to pick some up, i cannot believe you don't like cocoa! Anything that saves time is great! This is the perfect product for me. Im so lazy when it comes to moisturising. I dont do it enough! I do have lots of body butters to get through before I buy this though! That seems like a good idea. I want to try it now! Seems like the most convenient product in the world. I've been wrecking my brains trying to find a way to moisturise quickly for my 6am starts. Oh I love these! I have the exact same one as you, the scent is amazing. This is one of my favourite beauty products right now...so quick and easy to use! Will definitely have to get this, as I am just like you and don't have the time or patience to be waiting around! I bought this yesterday so only used it once and i love it! I got the Aloe Fresh too and you can smell it straight away. Great product to buy!